anynines’ data services team announces the beta release of its metrics and syslog solution »a9s LogMe« for PCF tiles. The a9s LogMe tile allows to provision Elasticsearch, Logstash and Kibana, i.e. the ELK-stack. Simply bind your Cloud Foundry app to a9s LogMe and it will automatically start collecting metrics and syslogs from your apps and services. Where can you download the a9s LogMe tile? What is a9s LogMe and how can you benefit? In traditional setups logging was usually handled by a syslog server (e. g. Logstash or rsyslog) and an endpoint for metrics (e. g. Logstash or Graphite). However, the setup had to be administered manually, which was very tedious, especially if more than one setup or one setup for different users had to be configured. Frankly, regarding modern cloud setups such as Cloud Foundry, there is no really good solution for metrics and logs. Obviously, there is Prometheus, which is pretty good at collecting metrics in the cloud, but what about logs? However, logs and metrics are essential to run a cloud in production. That is why we built a9s LogMe, an automated, on-demand provisioning metrics and syslog solution for PCF tiles. 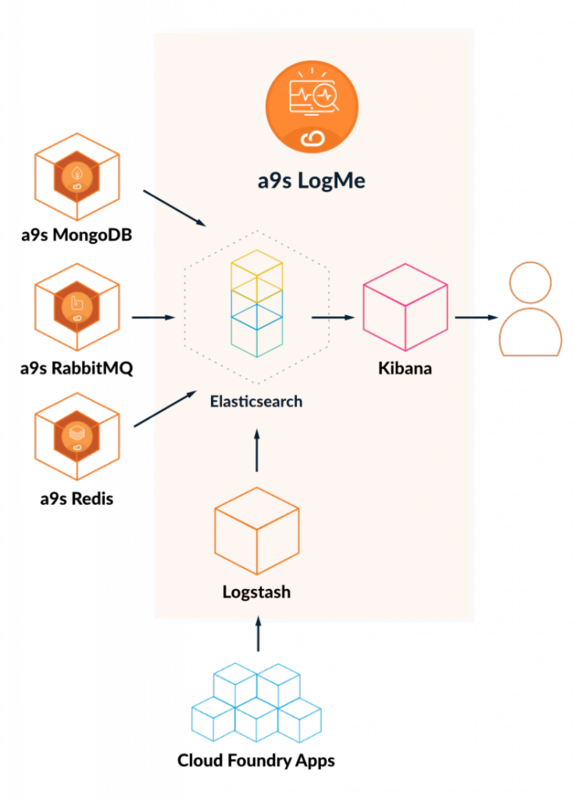 a9s LogMe is an Elasticsearch-Logstash-Kibana-Stack (ELK-stack) that can be deployed with one click to one or multiple instances for different customers. a9s LogMe collects the metrics and syslogs of your cloud and apps. To make the data searchable a9s LogMe comes with its own integrated and easy to use web frontend. a9s LogMe runs a Logstash instance, which collects logs and metrics from Cloud Foundry. Additionally, this Logstash is a syslog endpoint for apps running in Cloud Foundry. Because it relies on the ELK-stack, a9s LogMe integrates perfectly with the other a9s Data Services. Since each of the a9s Data Services runs a Logstash locally, the collected service logs and metrics could be sent to a9s LogMe’s Elasticsearch cluster, thereby allowing to overview the entire cloud setup in a single web frontend. I already have a system in place. Can I still use a9s LogMe? a9s LogMe can easily be integrated in an already existing setup with third party components for collecting and displaying metrics and syslogs. You can use a9s LogMe on its own or in any combination you wish. You can use a9s LogMe to collect the logs and – for example – Prometheus to collect the metrics. With a9s LogMe the cloud admin can define the syslog and metrics endpoint of each Logstash individually. However, the metrics endpoints must be compatible to Graphite. a9s LogMe is super easy to deploy. Your customers can deploy their own LogMe instances themselves. Every a9s LogMe instance remains totally isolated in the customer’s space. This guarantees that no sensitive data accidently become available to other users on the cloud. What features are in the pipeline? For the next release of the a9s LogMe tile we concentrate on Prometheus integration and on encryption for the ELK-stack. Feel free to get in touch. Give us a call or leave a comment. We would very much appreciate your feedback. Do you need to get a proof of concept installation running? Contact us for operations and installation support.